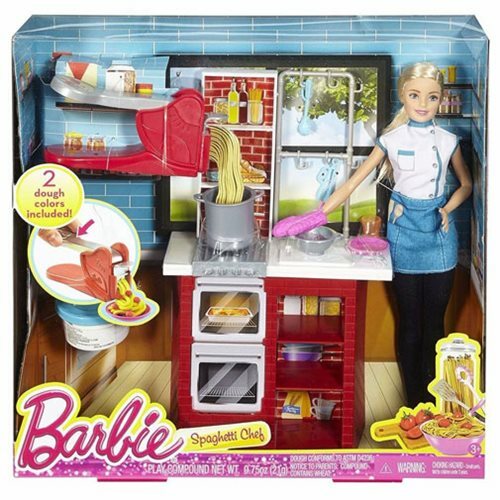 With the Barbie Spaghetti Chef Caucasian Doll and Playset, young chefs can explore restaurant ownership and culinary careers with Barbie doll while cooking up a spaghetti and meatball dinner using pasta and meatball dough. Two dough colors are included, along with an easy-to-use tool that creates pasta noodles with a simple push of the lever. Shelves and hooks hold accessories for storage and display, and themed decals add character and storytelling fun. Additional pieces take the meal from prepping to plating, with cookware and flatware for complete play. Plus, Barbie is ready to heat up the kitchen in a chef-inspired top with apron detail, black pants, matching shoes, and pink oven mitt. Ages 3 and up. Insert your selected dough into the pasta maker, and push the lever down to move the dough through the opening. Cook the pasta noodles in the pot on the stove in the kitchen with brick-detailed background stovetop, oven, counter, and cabinet. Then twist the noodles into a bowl and roll meatballs to top off the spaghetti dish. Voila! Dinner is served.